Usually, a tooth that has undergone a root canal can last the rest of your life and never need further endodontic treatment. But if symptoms persist even after successful non-surgical endodontic treatment your endodntist may advise surgery to save your tooth. Sometimes calcium deposits make a canal too narrow for the instruments used in root canal treatment requiring a surgical procedure to treat an infection or inflammation in the bony area around the end of your tooth. Surgery will aid in diagnosis and treatment. Surgery allows your endodontist to examine the root of your tooth, find the problem, and provide treatment. In this surgical procedure your endodontist reflects the gum tissue near the root end of the tooth, examines the underlying bone, gains access to the root end, removes infected tissue and resects the root end. 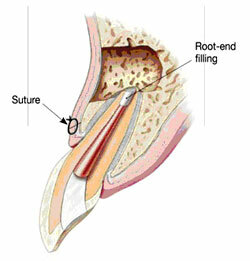 He then seals the root end with an inert filling material and sutures the gum tissue back. 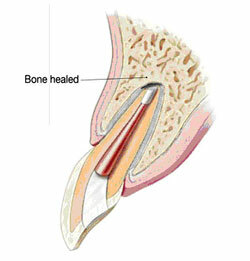 Over a period of months the bone heals around the resected root end. According to the American Dental Association, the difference between saving and losing a knocked out tooth, is the thirty minutes following the incident. If the tooth can be reimplanted into its socket within 30 minutes following the incident then your endodontist will delay the root canal treatment for 2 weeks in order to stabilise the tooth. 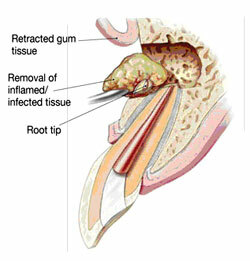 If more than an hour has elapsed, the root canal treatment will be performed prior to reimplantation. 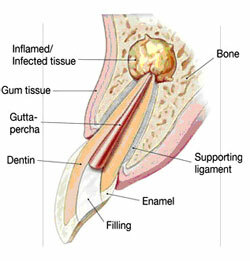 However the prognosis in such cases is guarded due to future root resorption and eventual loss of the tooth. Other surgeries endodontists might perform include dividing a tooth in half in order to elimimate a furcation involvement, repairing an injured root, or even removing one or more roots. Your endodontist will be happy to discuss the specific type of surgery your tooth requires.